FILE - Catalonia regional President Carles Puigdemont arrives for a statement following a plenary session at the Parliament of Catalonia in Barcelona, Spain, Sept. 6, 2017. Catalonia's secessionist leader on Monday faced increased pressure to abandon plans to declare the region independent from Spain, with France and Germany expressing support for the country's unity. The Madrid government, grappling with Spain's biggest political crisis since an attempted military coup in 1981, made it clear on Monday it would respond immediately to any such unilateral declaration. A week on from a referendum on independence which the government did its utmost to thwart, more signs were emerging that the fraught situation was also taking its toll on the business climate of Spain's wealthiest region. Catalan leader Carles Puigdemont is due to address the regional parliament on Tuesday afternoon and the Madrid government is worried it will vote for a unilateral declaration of independence. Catalan officials say people voted overwhelmingly for secession in the ballot, which was declared illegal by the government and was marked by police violence against independence supporters. But the issue has deeply divided the northeastern region itself as well the Spanish nation. Hundreds of thousands of unionists took to the streets of Barcelona at the weekend to protest against the region breaking away. Buoyed by the show of support, Spanish Deputy Prime Minister Soraya Saenz de Santamaria said on Monday: "I'm calling on the sensible people in the Catalan government ... don't jump off the edge because you'll take the people with you." "If there is a unilateral declaration of independence there will be decisions made to restore law and democracy," Saenz de Santamaria told COPE radio station. Backing also came from European heavyweights Germany and France. German Chancellor Angela Merkel spoke to Spanish Prime Minister Mariano Rajoy on Saturday about the crisis, her spokesman said on Monday. She stressed her support for Spain's unity but also encouraged more dialogue. France said it would not recognize Catalonia if the region unilaterally declared independence. Doing so would lead to Catalonia's automatic exit from the European Union, it said. "This crisis needs to be resolved through dialogue at all levels of Spanish politics," France's European affairs minister Nathalie Loiseau said. The European Union has shown no interest in an independent Catalonia, despite an appeal by Puigdemont for Brussels to mediate in the crisis. 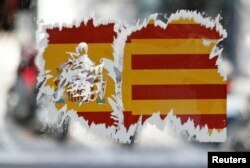 A defaced pro-union sticker is seen on a bus stop in Barcelona, Spain, Oct. 9, 2017. Under Catalonia's referendum law, deemed unconstitutional by Madrid, a vote for independence in the assembly on Tuesday would start a six-month process that would envisage divorce talks with Spain before regional elections and a final act of separation. Rajoy has not ruled out the so-called "nuclear option" of removing Catalonia's government and calling new regional elections if it claims independence. He gained some political cover for such a move on Monday when opposition Socialist leader Pedro Sanchez said in Barcelona he would "support the response of the rule of law in the face of any attempt to break social harmony." Sanchez stopped short, however, of explicitly saying his party would back dissolving the regional parliament, apossibility written into the 1978 constitution. Losing Catalonia, which has its own language and culture, would deprive Spain of a fifth of its economic output and more than a quarter of exports. A stream of Catalonia-based firms and banks have moved their legal bases outside the region. The boards of Catalonia-based infrastructure firm Abertis, telecoms company Cellnex and property group Inmobiliaria Colonial will meet on Monday to discuss moving, sources said. Banks Caixabank and Sabadell have already resolved to leave the region. The crisis has also reopened old divisions in a nation where the right-wing dictatorship of General Francisco Franco is a living memory easily revived by strong displays of nationalism. Among many moderate Spaniards there is widespread opposition to a breakaway, including in Catalonia. Regional authorities say about 90 percent of those who voted in the referendum backed secession, but turnout was 43 percent, with most unionists boycotting it. Sunday's demonstration in the Catalan capital helped calm Spanish markets on Monday, along with comments on Friday from credit rating agencies Moody's and DBRS that they expected Spain to remain united. Spanish borrowing costs fell to a one-week low and the main share index touched a week high. Puigdemont appeared resolute in a television interview on Sunday, saying the region's referendum law called for a declaration of independence in the event of a "yes" vote. Catalan police force failed to act. Madrid sent thousands of national police to the region to prevent the vote. About 900 people were injured when officers used rubber bullets and batons against voters in scenes that shocked Spain and the world, and escalated the dispute. Under a blueprint for independence drawn up by the Catalan parliament last month, the High court would be turned into a new Supreme Court of Catalonia. Puigdemont said on Sunday he had not been in contact with the Madrid government for some time because it refused to discuss independence. "What is happening in Catalonia is real, whether they like it or not. Millions of people have voted, who want to decide. We have to talk about this," he said. Rajoy has said repeatedly he will not talk to the Catalan leaders unless they drop their plans to declare independence. Additional reporting by Raquel Castillo and Robert Hetz in Madrid, Elisabeth O'Leary in Edinburgh and Madeline Chambers in Berlin; Writing by Mark Bendeich and Isla Binnie; Editing by Julien Toyer and Angus MacSwan.